The IBM® Hardware Management Console (HMC) provides systems administrators a tool for planning, deploying, and managing IBM Power Systems™ servers. This IBM Redbooks® publication is an extension of IBM Power Systems HMC Implementation and Usage Guide, SG24-7491. 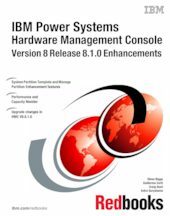 It explains the new features of IBM Power Systems Hardware Management Console Version V8.8.1.0.